Hi all, tell us who you are and what lead you into microservices? Hi, my name isMohamed, I work at Sfeir and I define myself as a Cloud Native Developer and Architect, I write code in Java, Python and Go, I also design a secured and automated cloud environments for big organizations. The first time I wrote a microservice, is when we started to create a lightweight versions of our big application to be able to run it quickly on our desktops, by stubbing a large parts that are not being developed. We realized that was possible to write multiple independent parts of the application to achieve the same functionality. Since then we were able to convince the management of the benefits of microservices ! Today, as a Cloud Architect, I assist our customers to move to the cloud, by helping them to choose the best option to make this move a success : one typical scenario is to migrate monoliths to microservices by using Kubernetes. Kubernetes help us to run microservices in a cloud-native manner, they handle failures gracefully, we can upgrade them without downtime and they scale automatically. Now, my challenge is to convince our customers to try and adopt Istio, they will be able to get rid of technical code written in their microservices (like handling communications errors or securing network), and developers will finally be able to focus on business code by letting “the platform do the hard stuff” ! Hi, my name isJulien, and as a Cloud Architect after being Java developer, I saw software architecture evolve to cloud-native applications at various customers. Microservices are often the chosen architecture to implement this kind of apps. During this one day workshop, what should the attendees expect? What would they learn? 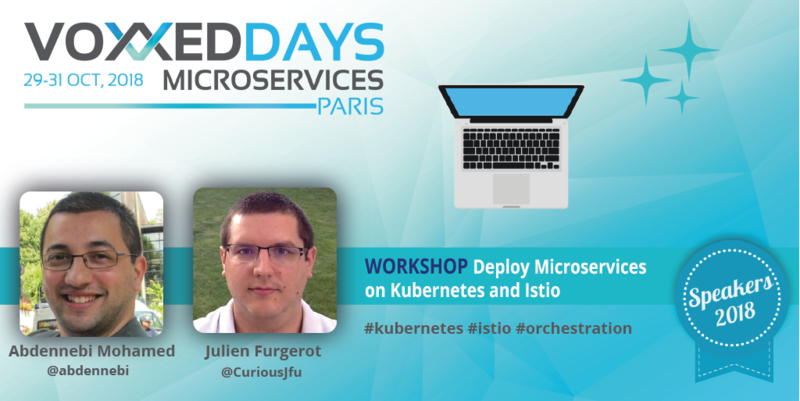 Attendees will understand how Kubernetes works internally and will learn how to deploy a microservice architecture on it. They will then be impressed by the additional features that Istio brings over Kubernetes and its ease of deployment. If their microservice doesn’t work, Istio will help them to find the issue ! Voxxed and Devoxx are part of the same family. Devoxx are community-organized conferences from developers for developers.